G. JUNCTION CHAMBER 23 C.M. X 30 C.M. Specifically useful for Rural areas. Tween Leachpits (Each 1.2 m. X 0.9 m. X 1 m.) to be used alternatively. Possibility to connect Water Seal Trap but limited use of water desirable. 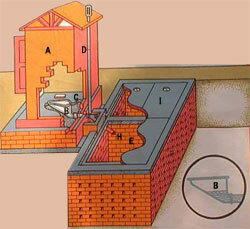 Honeycombed masonry for Leachpits for absorption of water.